mtDNA-based simulation of the species Homo sapiens in Europe starting 1600 generations ago. Homo neanderthalensis range in light grey. Mousterian is a name given by archaeologists to a style of predominantly flint tools (or industry) associated primarily with Neanderthals (Homo neanderthalensis). They date to the Middle Paleolithic, the middle part of the European Old Stone Age. Mousterian tools that have been found in Europe were made by Neanderthals and date from around 160,000 BP and 40,000 BP. Some assemblages, namely those from Pech de l’Aze, include exceptionally small points prepared using the Levallois technique among other prepared core types, causing some researchers to suggest that these flakes take advantage of greater grip strength possessed by Neanderthal physiology. In North Africa and the Near East, Mouseterian tools were also produced by anatomically modern humans. 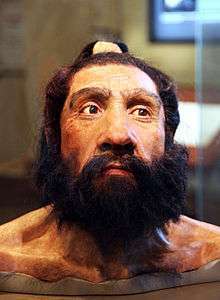 In the Levant, for example, assemblages produced by Neanderthals are indistinguishable from those made by Qafzeh type modern humans. It may be an example of acculturation of modern humans by Neanderthals because the culture after 130,000 years reached the Levant from Europe (the first Mousterian industry appears there 200,000 BP) and the modern Qafzeh type humans appear in the Levant another 100,000 years later. ↑ Currat, Mathias; Excoffier, Laurent (2004). "Modern Humans Did Not Admix with Neanderthals during Their Range Expansion into Europe". PLoS Biology. 2 (12): e421. doi:10.1371/journal.pbio.0020421. PMC 532389 . PMID 15562317.